I made this quilt about 7 years ago for my baby sister’s first baby boy. Have I really been quilting for that long? I had a lot to learn then (I feel like I still do.) Looking at it now there are some things I would do differently like adding more quilting, and using a better quality fabric for the border. 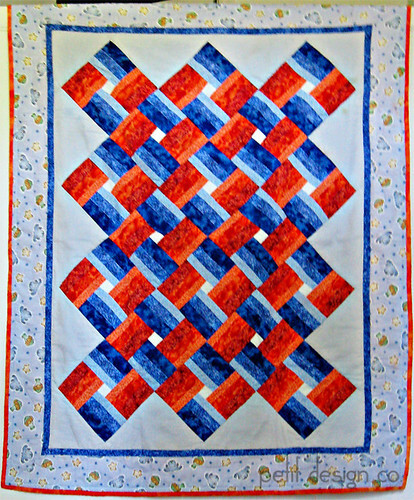 I still love the pattern (Serendipity by M’Liss Rae Hawley from her book “Phenomenal fat quarter quilts.”) Right after I made this one I cut out pieces for another one in a girly version… yeah, I still have the pieces all cut out. Maybe it’s time to find that UFO. I really love this pattern because it looks awesomely complicated but it goes together pretty quickly. It really is a great pattern. I can't believe you did that for your first quilt. Oh that's funny you still have those pieces! I have a big Ziploc of all the Funky Monkey scraps from my first quilt, too. One day I'll use them I guess!